Ramesh has made a distinguished career expertise in Agriculture /Food Commodities and Africa. His geographical supervision consists of 20 countries in Central, South and East Africa. His current strategic business unit employs over 3,000 people including 50 top global managers. He serves on the Olam's Global OPCO and ManCo. Ramesh joined Olam at its inception in Nigeria 24 years ago, and has been a part of the core team that saw the company grow from a green field start up to a Singapore listed USD 18 billion revenue organization today. 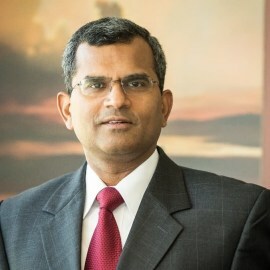 Ramesh has lived and worked in multiple countries across Africa and also headed Olam's India operations at one time and started Olam's trading desk in Europe before returning to Africa. Ramesh has worked closely with farmer groups, worked alongside government programs, set up and run logistics and processing operations and also set up distribution structures in a variety of African markets. He is widely consulted by banks, government structures, NGOs and private businesses. He is based in Durban and teaches at the University of Cape town.